I am a big fan of using the command line as most of you know by now. This applies to interacting with IBM Bluemix cloud and its services and for database systems like DB2 or dashDB. 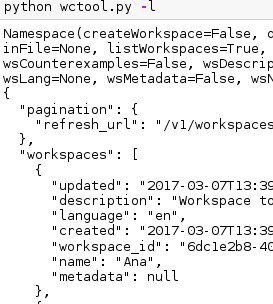 Thus, I was excited when the IBM Watson Conversation service added API functions to manage workspaces. To test the new API I wrote a small Python-based tool to manage my Conversation workspaces. It both demonstrates the API usage as well as gives you a nice command line tool to list your workspaces, update them, save local copies or even create or delete workspaces. Read on and learn how to manage your Conversation workspaces. Today, I wanted to share some exciting news with you. Most of you know that I am German. Thus, it is terrific to have IBM Bluemix available from Frankfurt, Germany, today. As can be seen on the screenshot on the right, the new Bluemix region is labeled "eu-de". 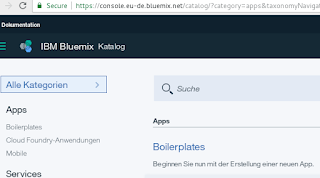 Having Bluemix Public in Germany is a big step for the IBM Cloud and customers alike. Being located next to DE-CIX means low network latency for German and European customers. Utilizing Bluemix Public in London ("eu-gb") it is possible to deploy applications with high-availability requirements redundantly within Europe. The database-as-a-service offerings dashDB ("DB2") and Cloudant are already available in the Bluemix catalog. More database and analytics services are to follow. 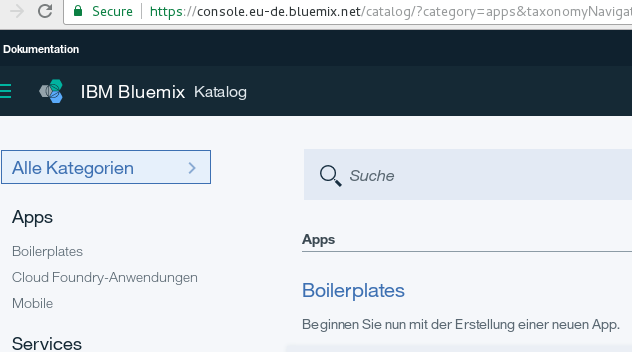 You can check out the list of initial services here in the Bluemix Catalog for Germany.